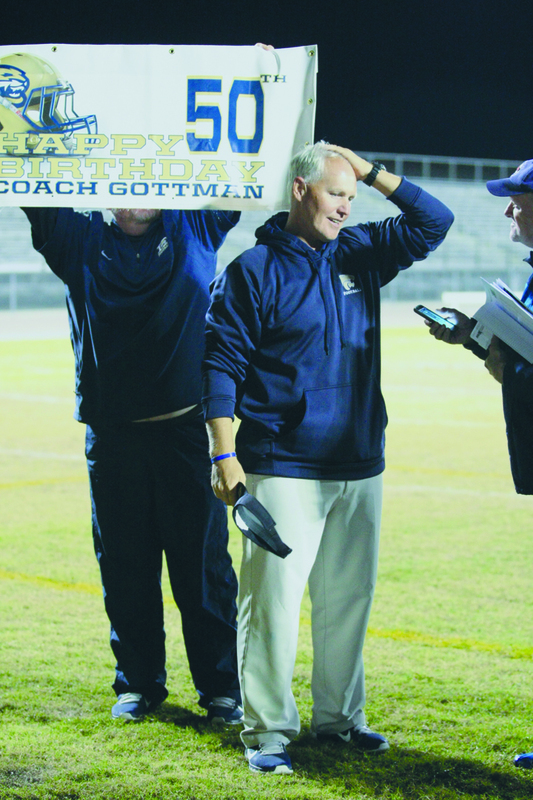 With a 28-7 regular season final home game victory, the Durant football team celebrated its senior night, the 50th birthday of Head Coach Mike Gottman, and securing the Cougars playoff spot as Class 7A District 8 champions. While Durant dominated the game allowing East Bay to score its only touchdown in the final minute, the earning of the championship depended on the outcome of the football showdown just a few miles up the road between Brandon and Plant City. 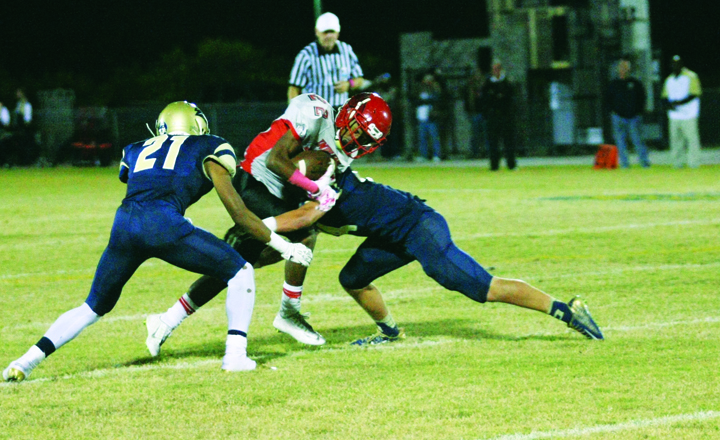 A Brandon win would have given the Eagles its first district crown since 2007. By stretching the score to the game’s final seconds, the Raiders 20-14 win over Brandon, gave Plant City its runner-up status and handed Durant the district title. Gottman added that he was very proud of his d-lines performance against the Indians, but added that East Bay has earned his respect. “They have played a hard game all the way to the end and it showed,” he said. 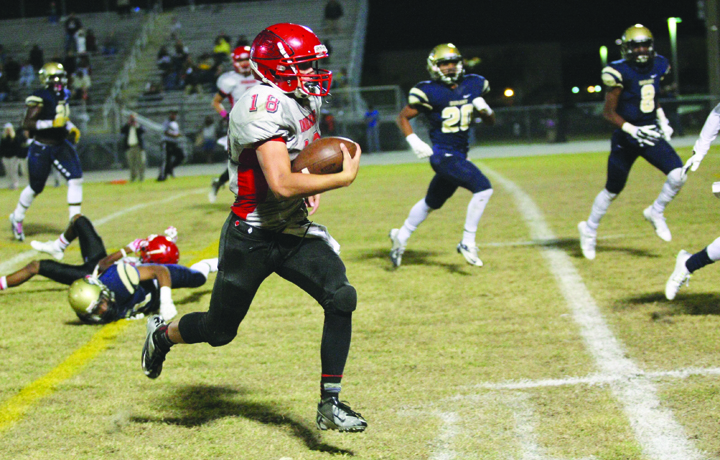 The Cougars dominance over the Indians started early with senior quarterback Erick Davis scoring on a 53-yard touchdown run in the first quarter. In response, East Bay came close to keeping Durant at arm’s length, but Cougars sophomore Kamerron Joyce had winning in mind as he extended the score 14-0. T o widen the lead and eventual final score, Cougars senior running back Crispian Atkins, who finished the regular season just shy of reaching 1,000 yards, managed to sport two touchdowns for the game including one in the fourth quarter to make it a 28-0 game. Exhausted and battling a solid team, East Bay was not going to leave empty handed. After a strong drive down the field, the Indians gave it all they had left. In the fourth quarter, sitting on the goal-line with no more chances as the clock set at 1:10, Kuykendall pushed his way the Cougars defense, earning his and his team’s final touchdown of the season. For more information of the rest of the post season, visit www.fhsaa.org.